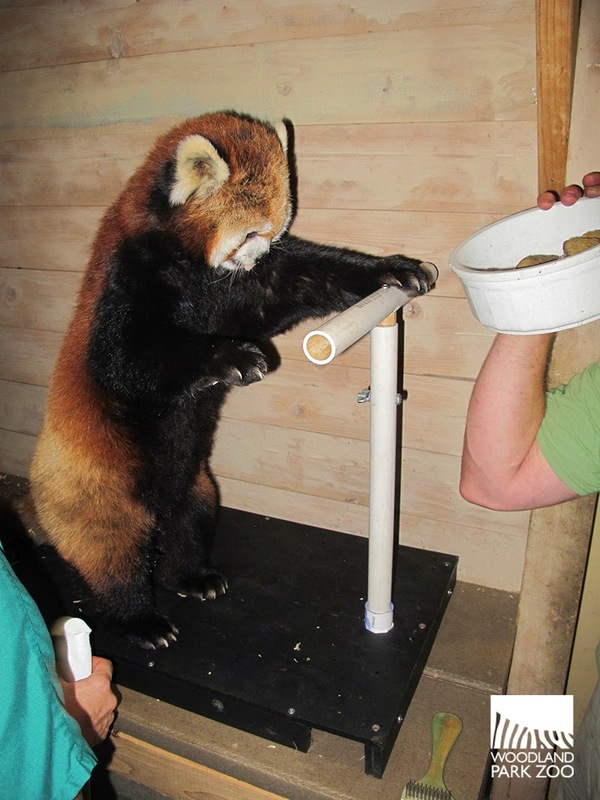 Woodland Park Zoo Blog: How do you give an ultrasound exam to a red panda? 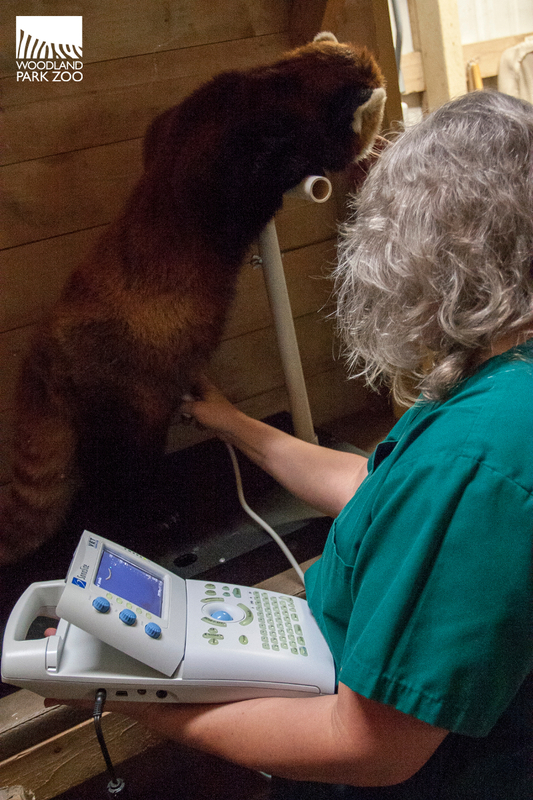 How do you give an ultrasound exam to a red panda? Stellar. Photo by John Loughlin/Woodland Park Zoo. 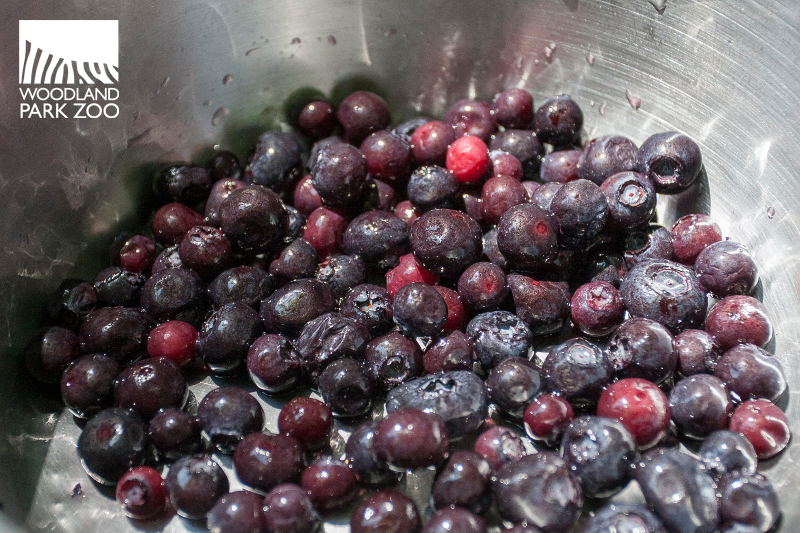 Enticed by a bowl of blueberries, red panda Stellar knows what to do. She makes her way to her keeper in a behind-the-scenes room, gets up on her hind legs and props herself onto a T-stand—constructed by the keeper for this very purpose—and waits for her reward. 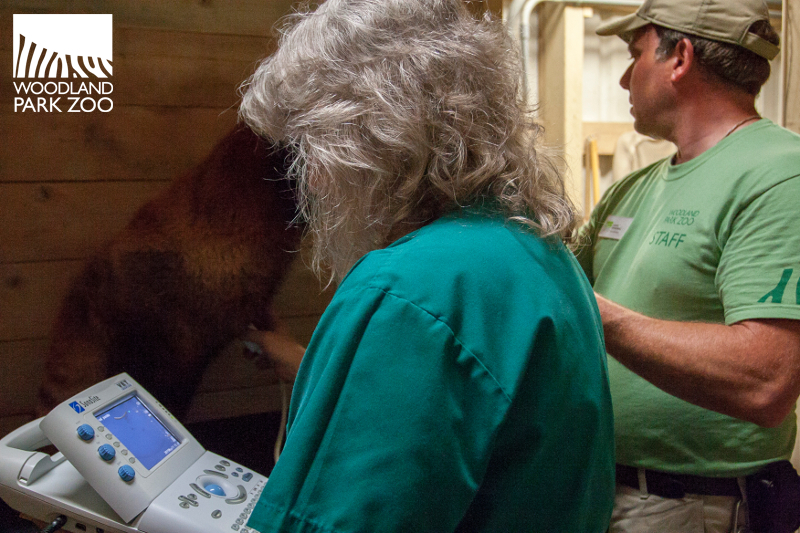 While Stellar takes berries from her keeper or sometimes buries her face full in a bowl of biscuits soaked in apple juice, a member of our animal health team conducts a non-invasive ultrasound exam on her. We’re hoping for signs that will verify a pregnancy. 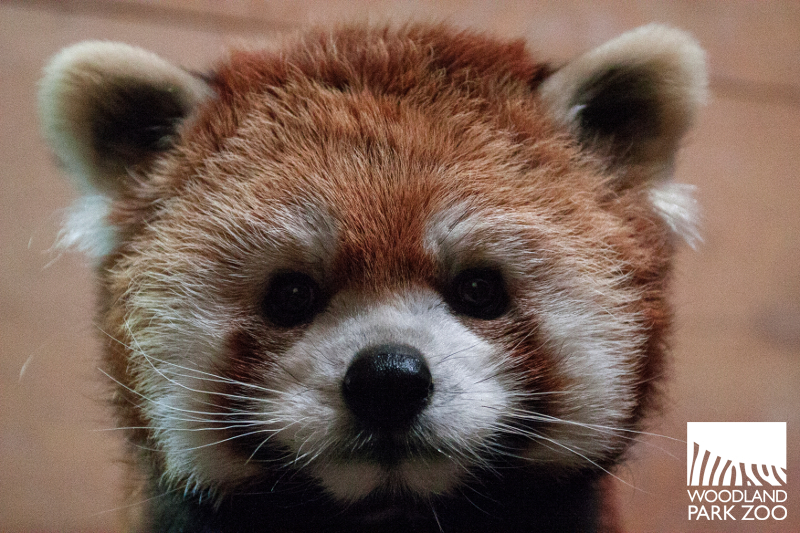 Several months ago, we introduced our new male red panda, Yukiko, to 8-year-old Stellar. The pair has successfully mated and now the ultrasound examinations are regularly underway—every two weeks—to determine a pregnancy. 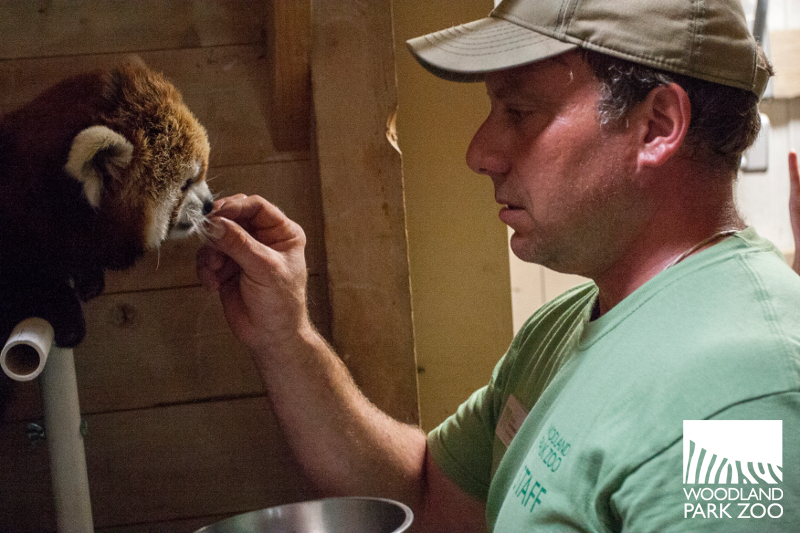 According to curator Mark Myers, there is not a current test to determine pregnancy in a red panda. To validate a pregnancy we rely on ultrasound exams and behavioral changes. Our red panda keepers began training Stellar last year for ultrasound exams with the innovative technique, which we are using again during this breeding season. A scene from last year’s ultrasound training sessions. Photo by Kirsten Pisto/Woodland Park Zoo. Stellar is a mellow girl. Her willingness to cooperate with the exams helps our keepers and veterinary team continue to perform this important diagnostic procedure. The breeding season for red pandas occurs from early January through the end of April. If pregnant, Stellar is anticipated to give birth this month or in August. Though Stellar has not had any viable offspring yet, there is reason for some cautious optimism—Yukiko has successfully sired seven offspring before. In the wild, fewer than 10,000 red pandas remain in their native habitat of bamboo forests in China, the Himalayas and Myanmar, and share part of their range with giant pandas. Their numbers are declining due to deforestation, increased agriculture and cattle grazing, and continuing pressure from growing local populations. 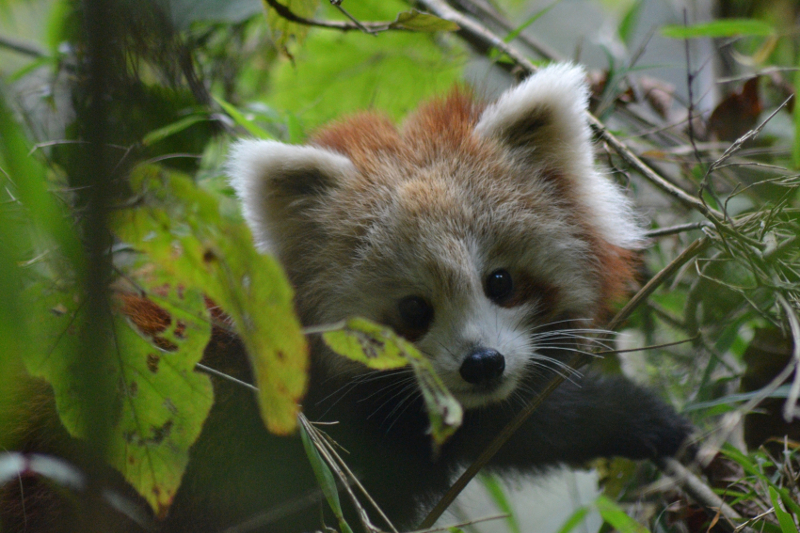 Wild red panda cub spotted in Nepal. Photo courtesy of Red Panda Network. Every time you visit the zoo, you help us support the Red Panda Network through our Wildlife Survival Fund conservation program. While Stellar is currently living off view—where she can give birth in an air-conditioned room in case she is pregnant—look for Yukiko in the zoo’s Temperate Forest in the Wildlife Survival Zone. Since red pandas are placental mammals, if you could collect urine could it be tested for the red panda equivalent of HCG that humans produce when the placenta starts to grow? Might be trickier than having her stand up to eat treats during an ultrasound though!